← Day 92: Chinese Tuina Massage. The Mexican Loch Ness monster. Before we get into the whole ROM thing, I have to confess that probably my favourite thing about today was finally getting to pop my Grand Electric cherry. This Mexican restaurant in the people’s republic of Parkdale has been lined up practically since the day it opened late last November. We lucked out in that the weather was crap, and apparently not many hipsters want to queue in the rain – maybe it messes with all the product in their hair? Dunno. So, even though we got there a mere 15 minutes before they opened at 6 pm, we were able to get one of their coveted tables in the first seating. It was like winning the foodie lottery! A platter full of happy goodness. 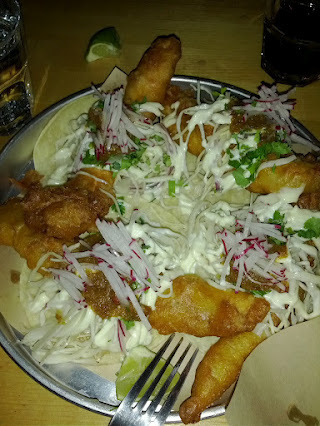 I am delighted to report that the spicy squid, baja fish tacos, and guacamole and chips, served with a large, salty pork rind, all lived up to the hype. Indeed, the Colonel himself would have had to admit that the food was truly finger-licking good – as my fellow diners can attest. 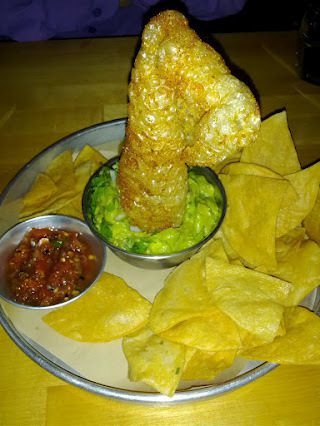 The reasons I will return are several: to try the queso fundido, some of their bourbon-based cocktails, and possibly one of their two desserts. And, of course, simply for more of everything – I mean, who doesn’t love yummy delicious food at incredibly decent prices?!! Okay, with that off my chest, we can now move onto my second first of the day, which was attending Friday Night Live @ROM. The Royal Ontario Museum (ROM) is not just for dinosaurs anymore. Who knew?!!? This way to the waffles. 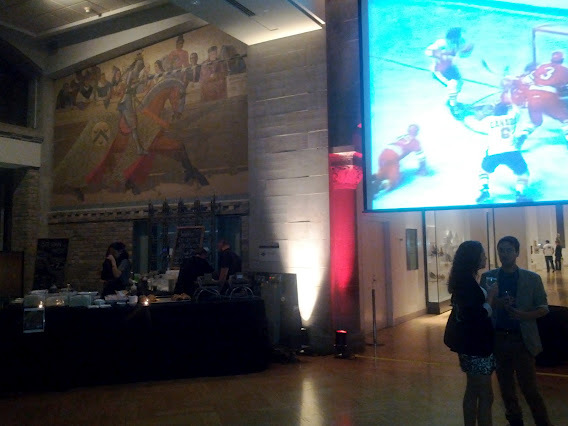 For 10 weeks every spring, in addition to offering discounted admission every Friday from 3-5:30 pm, the ROM re-opens its doors from 6-11 pm for adults only, where many of the exhibits become backdrops for lights, music, nibblies and drinks, not to mention a sizeable dance floor. And all that for a measly $9! So if you’re a bit of a hipster who has always wanted to get jiggy with a T-Rex up close and personal, this is the place for you. Each of the ten Live Fridays has a theme. There have already been nights centred around topics such as earth week, movies, fashion, photography, and local music, to name a few. Tonight, however, was special: Oh Canada, Eh? It was a celebration of the average Canuck’s favourite pastimes. 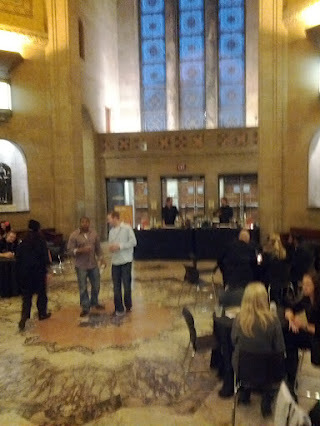 Surprisingly, no one was serving poutine, although JK Frites was there, so really, it was my fault for not bringing the purse that I had packed with the cheese curds and gravy to make my own. Next time… c5 did have some noodles on offer, though, which is always a crowd pleaser. Of course, with a theme like Oh Canada, Eh? there were ginormous screens everywhere showing, what else, hockey. On one entire wall of the main gallery, conveniently located between Fidel Gastro and Waffle Bar tasty street eats, the legendary 1972 Canada vs. USSR game 8 of the Summit Series in Moscow was being projected for all to enjoy. As if that weren’t enough, NHL’s Greatest Goals From the Last Quarter of the 20th Century was also playing in another area, presumably because, statistically speaking, the odds were in our favour that the goals were all scored by Canadians. On the second level, we found an entire hall that was dedicated to another one of the country’s biggest passions: comedy. If you don’t like to laugh, then do not apply for citizenship here, because you will never fit in. It’s as simple as that. Live performances were held by the infamous The Second City improv troupe, interspersed with screenings of Martin Short’s latest movie. Good times were had by all! A couple of other galleries were open as well, with knowledgeable staff at the ready to answer any questions you may have, in addition to where can you buy ROM Bucks for the bar, which was also thoughtfully serving that all-Canadian classic cocktail, the Caesar, and finding out where the washrooms were. 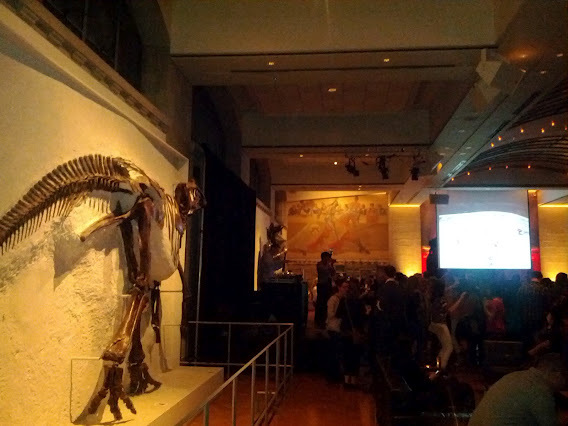 The galleries closed at 9:30 pm, which resulted in an instant infusion of energy to the dance floor, that carried into last call at 11 pm, because apparently dinosaurs need their beauty sleep, too. ElectriCITY Events provided the DJs, who were indeed keeping everyone hopping, except for the phone freaks who were following a sort of scavenger ‘trek’ around the building. 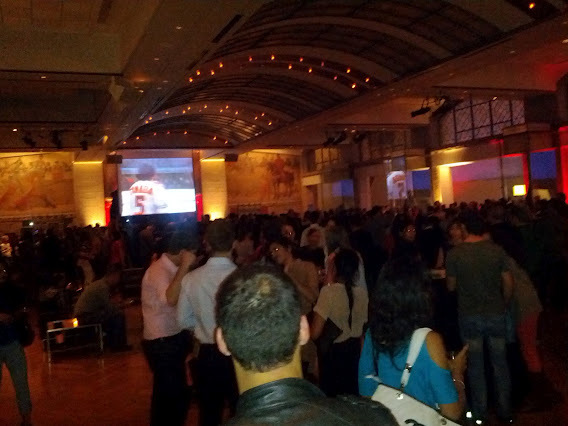 Like everything else these days, the night also had its own Twitter feed at #FNLROM. I think you’re starting to get the gist here that it’s a very cool venue, and an even hotter event, so get your buddies together and shake your bootie over there, because it only continues on Fridays through June 22nd, with no do-overs. Just remember to bring your steel-toed shoes in case you want to get down with Mr. T-Rex, since he is rumoured to have two left feet. This entry was posted in Fun and Crazy and tagged Crazy, Friday Night Live @ROM, Fun, Grand Electric, June, Parkdale, ROM, Royal Ontario Museum, Toronto. Bookmark the permalink.